When it comes to making drinks for your Halloween party, the last thing you want to do is be stuck at your bar shaking cocktails all night. Halloween also isn’t the time to be busting out your finest spirits. During Halloween people are less concerned with the complexity of your single malt scotch whiskey than they are about the cool costumes. There are two great options with spirits to make your Halloween party a hit: Punches and Sweet Spirits. The first (and probably best) option for Halloween parties are punches. Punches actually pre-date cocktails when people used sugar, spice, fruit and water to help take the edge off of high-proof spirits. The same concept works amazingly well now and with all the prep work easily done well before your Halloween party, you can be free to enjoy the festivities. by Jason Kosmas & Dushan Zaric , an absolutely superb book on classic cocktails. This fantastic fall punch incorporates some of the great fresh fall fruits available in October and mixes them with the deliciously funky Smith & Cross Rum and crowd-pleasing Laird Apple Jack. The recipe was adapted from the Philadelphia Fish House Punch, which was a favorite of George Washington. The Jersey City Fish House Punch makes 5 3/4 quarts (which is 184oz), so if people get about 6oz at a time, it’ll cover 30+ drinks. It also uses standard measuring tools so you don’t need any real bar tools to make this drink. 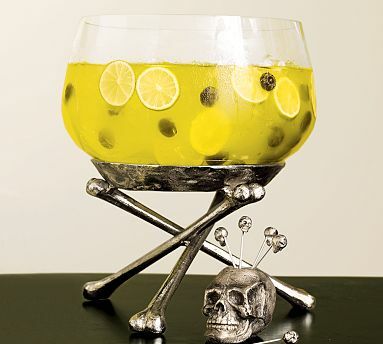 Combine fruit in a large punch bowl, add rum, Apple Jack, juice, water and liqueur. Refrigerate for at least 4 to 5 hours. Just before serving add ice, then serve. For an added zip, add more lemon and lime wheels to a round Bundt cake pan or jello mold, add ice to keep it in place, and then fill with water. Put it into the freezer for a few hours and then release the ice by turning the mold upside down and running it under a stream of hot water. Punches are a great option for serving a lot of people quickly on Halloween with most of the work done in advance, but we love the fact that the proverbial bar gets lowered for Halloween parties, making it a fun time to bring out sweet spirits and liqueurs that might not fit during other times of the year. 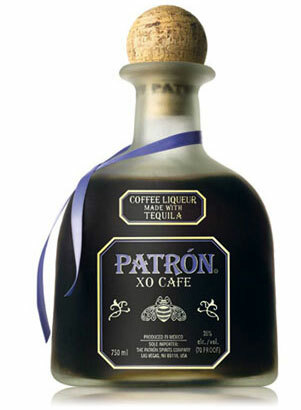 A crowd pleaser that’s actually under the radar screen of most drinkers is Patron XO Coffee Liqueur. This delicious coffee liqueur is literally is half the price of Patron Silver Tequila even though it’s made with Patron Silver and coffee, and it is still 70 proof! Throw a bottle of the Patron XO Coffee Liqueur in the freezer the night before your party and you’ll enjoy the results. There IS caffeine in the Patron XO Coffee Liqueur and it does give you quite a kick. Pour Travis Hasse’s Original Cherry Pie Liqueur over ice and then fill the rest of the glass with the cola or lemon lime soda. A very easy and quick drink. Pour liqueur into a blender, add the ice cream and blend until soft. Both of these pie liqueurs are easy drinking and ideal for a party where you want to serve something fun alongside beer. Halloween is a great time to bust out something a little different. For us it’s a time to celebrate the fact that spirits don’t have to be fancy or pretentious. You can get as much enjoyment out of a ‘serviceable liqueur’ done in a fun way at a party as you can with a top shelf spirit on a nice night out. Post in the comments below your favorite Halloween Spirits and Drinks!